Welcome to our buying guide to help you choose the Best Self-Propelled Lawn Mower for Hills. Let’s face it, mowing the lawn can be tedious and tiresome, especially if you have hills on your land. Investing a self-propelled lawn mower will make your life so much easier. Trust me on this, you won’t regret it. Although this article is primarily focused on walk-behind lawn mower we also recommend a couple excellent sit down mowers for hills as well. We hope you find this article helpful. We do all the research so you don’t have to. A garden with rolling lawns is a majestic sight, they create an air of elegance that you don’t see when the lawn is perfectly flat. Though cutting your lawn on a hill requires more effort and this makes a mower that’s been designed for hills quite a necessity. Choosing the best lawnmower for hills is something that you need to pay particular attention to, especially if you have a large yard. Using a lawnmower that isn’t the best for hills can be back-breaking work, it can also become dangerous if the hills are too steep. When you start looking at self-propelled lawnmowers for hills, prices can become prohibitive for the average homeowner. That’s where this article is going to aid you. Not only will we be reviewing four of the best self-propelled lawnmowers for hills, but I’ll also provide you with a complete buyers guide. Your neighbor’s lawnmower may look very impressive and be the best for his garden. Though this might not be the case for you. We’re all different and our yards are as individual as our personalities. You’ll need to choose the best lawnmower for your circumstances. It’s not just the slope of your lawn that we’ll be considering. You may need more power assistance – a mower that’s going to do more of the heavy work for you. If you have a lot of trees and flowerbeds, you want a mower that’s easier to maneuver around obstacles. If your garden isn’t all that big, ¼ acre or less, a regular push mower might be fine and will cost less than any other. For larger gardens, fatigue is going to set in quite easily if you’re pushing the mower all day long. For yards up to a ¾ acre, you’ll be better off with a walk behind, self-propelled mower. These machines cost substantially less than ride on lawnmowers but help you by using the power of the lawnmower to move them. This takes most of the strain off of you and the mower does most of the heavy work. When you go larger than a ¾ acre, you may want to consider a ride on lawnmower, they take the least effort to use and will allow you to mow large sections of lawn easily and quickly. A ride on lawnmower is going to be the most expensive, so you’ll want to be absolutely sure that this is what you need before paying for one. For the purposes of this review, we’ll be concentrating on self-propelled walk-behind lawnmowers that are the best for hills. These are relatively inexpensive machines for the job that they do. You shouldn’t expect to pay more than $550 for a great lawnmower that can handle hills. That’s the high end of the price scale, and you can get cheaper. Prices change and special offers come and go, so there’s no telling what the retail price will be when you buy any of these mowers. All I can say is that for the summer of 2018 you can expect to pay in the region of $350 to $550 for a decent lawnmower for hills. What should you look for in a self-propelled lawnmower for hills? Some of these lawnmowers will be front wheel drive, while others will be rear wheel drive and you even have the option of four-wheel drive. This is going to be an important factor to consider. Then there’s the method of propulsion – electric or gas. There are also less obvious things that you might not have thought of. You might want a lawnmower that’s going to effectively collect the grass clippings for you. This may not seem too important, but where is the collection bag? Is it at the back of the mower or on the side? Do you want a lawnmower that mulches the clippings as you cut the grass? Some mowers will also collect and shred leaves as they cut, turning all your garden waste into compost-ready, mulched material as you mow the lawn. Through the course of this article, you’ll find the answers to these questions and a whole lot more. So there really is a lot to consider. For those of you who are simply interested in finding the best lawnmower for hills, we’ll start by reviewing our selection of the best machines available. They differ in many ways, so you’ll be able to find the mower that works for you. There’s a good variety of prices and you’ll easily find one to suit your budget. If you have questions relating these lawnmowers, I’ll go on to provide answers to those questions after reviewing the best lawnmowers for hills. You’re going to find the answers here and, by the time you’ve read this article, you’ll be equipped to make the best decision on which lawnmower is going to work for you. You’ll know what to look for. For a quick overview, here’s a list of the lawnmowers that we’ll be reviewing. Snapper XD 82V (SXD21SPWM82K) – For those of you looking for a battery-powered lawnmower for hills, this should be your first choice. You’re paying extra for the battery option, that’s always the case. It’s a very powerful 21” self-propelled mower with features to rival any of the best gas-powered options. Jonsered L2621 – This is another great option for those looking for a budget lawnmower that’s up there with the best of them. Powered by a fantastic Briggs & Stratton engine, this 21’ self-propelled lawnmower offers exceptional value for money. Troy-Bilt TB270ES – A very affordable 21” self-propelled lawnmower for hills with a host of great features including mulching. So you’re in for a feast of great lawnmowers and I’ll be providing a detailed and comprehensive review of all these exceptional machines. 22-inches wide, All Wheel Drive (AWD), Honda engine. 3-in-1 cutting system : bag, mulch and side discharge. One of the best self-propelled lawn mowers for hills. Innovative AWD system can tackle any terrain with ease. Self Propelled. If you’re one of those guys who places quality and advanced engineering above price, then the Husqvarna HU800AWDH is the best option in this class of lawnmower for hills. Personally, I’m always prepared to pay more for a Husqvarna product. It’s not just about the great quality. Husqvarna machines are incredibly robust, they also offer so many engineering wonders that make them really easy machines to use. For starters, they’ve chosen to use the Honda GCV 190cc enghine to power this lawn mower. Like any Honda engine, this is one of the best for all working conditions and you’ll get many years of trouble-free use from this mower. The automatic choke makes it easy and effortless to start. Even though this engine doesn’t have an electric starter, I can’t see anyone having a problem – the recoil starter is easy to use and this engine is known to be quick to start. Another remarkable piece of engineering is the four-wheel drive or all-wheel drive system (AWD). In conjunction with oversized 12” rear wheels, the all-wheel-drive system makes it super easy to maneuver in any conditions and offers the best traction on hills. This already makes it by far the best self-propelled lawn mower for hills and worth paying extra for. Has a side bumper that doubles as a grass rake to pull in the grass for a clean trim. When it comes to ease of use, you have the benefit of superior traction and even power distribution, along with this, you also have one of the best designed loop handles with plenty of luxurious padding and a superbly curved design. It has a super easy dual trigger control for the speed settings – you’re able to control the speed with either hand. Your speed settings are basically infinite, so you can set it for the perfect speed to match your working conditions, ranging from 0-3 MPH. The handle also folds down into a completely flat position for very compact storage. 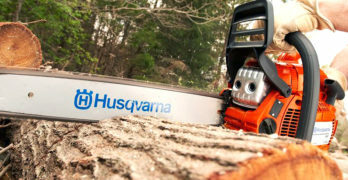 Moving on to the ultra-durable 22” deck and very effective 3-in-1 cutting system, the Husqvarna continues to display its superiority. The deck has a hose attachment for easy cleaning and I can’t see rust ever being a problem, that’s something I’ve come to expect from Husqvarna – a build quality that can’t be beaten. It has a four point adjustment to get a perfectly level cut on any surface. The 3-in-1 cutting system allows for a regular bag at the back or for mulching and side discharge. Even though this is one of the toughest lawnmowers, it’s not the heaviest at just 91 LBS. With just about the most comfortable handle, perfect height settings, and all-wheel drive it’s still the easiest to use and having a few extra inches on the rear wheels really helps a lot too. Buying a Husqvarna mower always gives me a sense of confidence. They offer fantastic dealership service and are always very helpful. Getting parts is never a problem, even after many years. The same can definitely be said for the Honda engine, it’s perfectly engineered and built to work hard. So even though the 1-year warranty isn’t as long some other manufacturers offer, I still feel that this about the best lawnmower for hills and is made to the highest standards. 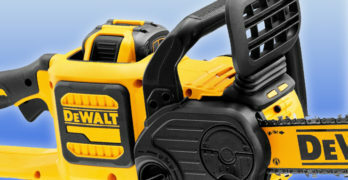 21-Inches wide, 82-volt battery powered (2Ah battery included). One of the best self-propelled lawn mowers for hills. You’ll be surprised this mower is powered by batteries. Impressive technology. Includes (2) 2Ah Lithium ion batteries and a rapid charger. Can be stored vertically making it easier to fit in tight spaces. Overmolded rubber handle is comfortable to hold. Load Sensing Technology allows for the power to adjust to meet the demands of the cutting blades. 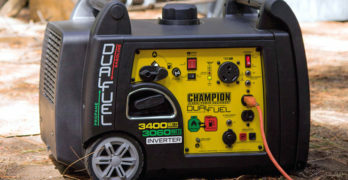 Despite being more expensive than equivalent gas or corded electric lawnmowers, battery-powered models are growing in popularity. If you want to know more about the pros and cons when choosing between gas and battery-powered mowers, I’ll discuss this in detail later in the best lawnmower for hills buyers guide. This is the only battery-powered lawnmower we’ll be reviewing here and, while it’s more expensive than the gas-powered models, it offers great value when looking at similar mowers that use a battery. The Briggs & Stratton 82V batteries are excellent and you’ll have the option of using a 2AH, 4AH, or 5AH lithium-ion battery. The Snapper XD SXD21SPWM82K comes standard with two 2AH Batteries and a rapid charger. The working time when using both 2AH batteries is about 30-45 minutes and it takes 30-minutes to charge a flat battery back to 100% capacity. The brushless electric motor is super-efficient and has electronic load sensing, so it will only use as much power as is needed, optimizing your working time from the battery. This is a very capable lawnmower for hills and the fact it uses an electric motor instead of a gas engine is, by no means, a disadvantage. It can handle anything that comes its way with 7-height settings that you adjust easily with a single lever. The handle is perfectly designed with thick rubber padding for total comfort and you have perfect speed control by means of a trigger switch on the handle. They’ve paid special attention to storage when designing this mower. If you don’t have much garage space for storing your mower, you’ll definitely appreciate the vertical storage aspect of this mower. It weighs 90 LBS, which is the kind of weight I’d expect for a tough lawnmower with high-quality steel deck. The rear wheels are bigger than average (10”), it has 8” wheels at the front and this makes it a very easy mower to operate with really great traction. The 21” deck is as good as any in this class and offers the versatility that you’d expect from one of the best lawnmowers for hills. The 3-in-1 cutting system gives you the option of using the reasonably large 1.6 bushel rear-mounted collection bag, mulching or side discharge. If you prefer the silent running and easy starting of a battery-powered lawnmower but still want the same capabilities of a gas-powered machine, the Snapper is going to fully meet your needs. There’s a great variety of garden tools in Snapper XD range, so you can make full use of the great 82V batteries in all your tools. You won’t be able to beat the warranty on this machine – 5-years on the lawnmower and 2-years on the batteries. 21-inches wide, 163cc Briggs & Stratton Engine, 9 cutting heights — One of the best self-propelled lawn mowers for hills. Water hose connection makes it easy to clean the cutting deck. 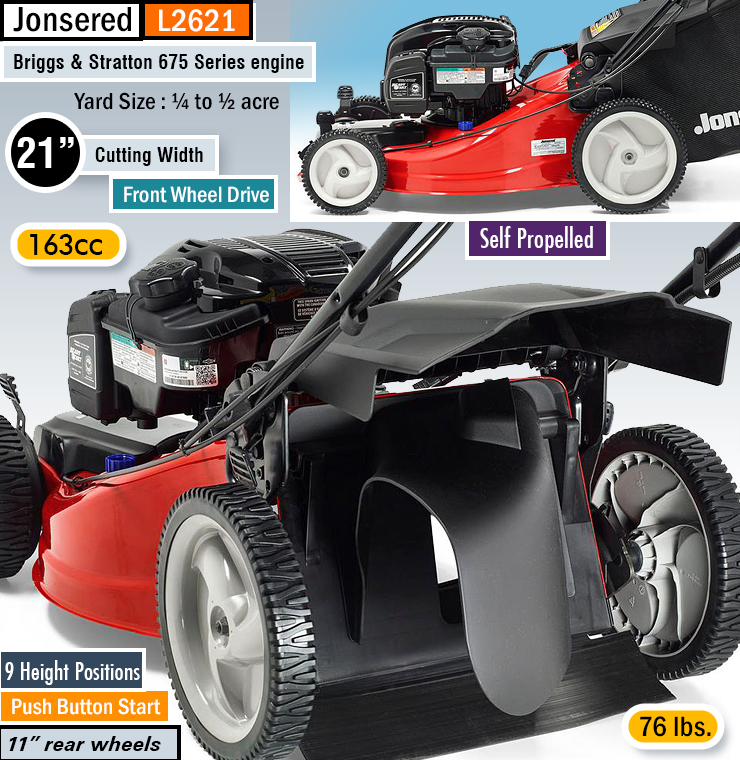 ✓ View or download the MANUAL the Jonsered L2621 lawn mower. The Jonsered L2621 is almost as cheap as the Troy-Bilt TB270ES and this makes it a hot competitor for the best lawnmower for hills if you’re buying on a budget. When looking at the features and specs for this machine, I can easily see why it is so highly rated. Without a doubt, one of the best lawnmowers for hills and the very reasonable price just adds to its appeal. The Briggs & Stratton 675 series 163cc engine is a remarkable piece of machinery. I was never a big fan of the older Briggs & Stratton engines. So when this series was introduced a few years ago, I took a very skeptical, yet in-depth look at what they did with this engine. To my surprise, this has turned out to be one of the best. Personally, I’ll always be somewhat biased in favor of Honda engines (they’ve never let me down). Despite this, I’m thoroughly impressed with this engine from Briggs & Stratton. It starts with the least amount of effort, there’s no fuel priming needed and it has an electric starter – the push-button starter is on the handle to make things even simpler. Briggs & Stratton has done a lot to make their new engines much easier to start, even in very cold weather. It’s certainly powerful enough and propels the mower via the front wheels. The 21” steel deck is robust and has 9 height settings that are easy to adjust. The handle has good adjustments but has no padding. You’re holding a cold, rather thin, steel tubing handle which doesn’t impress me all that much. The speed control, on the other hand, is fantastic. There’s no small trigger switch, instead, it has a bar that traverses the full length of the handle, so you can grip it in a position that works for you and maintain perfect control over the mower. Ironically, they’ve provided padding on the control lever but not the handle itself – go figure! The deck has a four-point height adjustment and it has big rear wheels. They don’t give specs for the wheel size and, I’ll have to admit, I didn’t measure them. Though I’m pretty good at judging wheel sizes and I’d say that it uses 10” wheels at the rear and 8” at the front. It’s a breeze to use and this mower is a few pounds lighter than most of the others – 85 LBS. The deck also has a hose attachment for easy and convenient cleaning. The Jonsered L2621 is a real winner, offering excellent quality at a very affordable price. The engine is truly magnificent and it has the general feel of a well-made product. This is clear proof that you don’t need to spend all that much to get one of the best lawnmowers for hills. 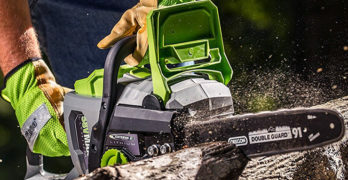 21-inches wide, 159cc engine, Tri-Action cutting system with 3-in-1 mulching capabilities. Best self-propelled lawn mower for hills. FWD Self-Propelled Mower With Electric Start. ✓ View or download the MANUAL for the Troy-Bilt TB270ES. As the cheapest lawnmower in this review, the Troy-Bilt TB270ES comes as a very pleasant surprise. This is a brand worthy of some recognition, so you know you’re getting a high standard of quality. Along with all of that, you’re also getting some really cool features and a high spec level. The 159cc OHV engine has ample power and it propels the front wheels for ease of use and great maneuverability. If a recoil starter makes you apprehensive, you’ll be glad to know that this mower has an electric starter for effortless operation. The tri-action cutting system is a unique and innovative feature that gives this mower superior cutting. A really simple rake bumper at the front of the machine lifts the grass as it moves forward. This allows for a very even cut and the blade, along with its symmetrical deck, makes for very fine mulching as it mows without any clumping. The collection bag is huge (1.9 bushels) and you have the option of using a side-mounted mulch discharge or the standard rear collection bag. The 21’ mulching deck is superb and very durable. A nice addition is the easy-cleaning attachment. There’s quick connector for the garden hose at the top of the deck which makes cleaning it absolutely no effort at all. The adjustable loop handle is both comfortable and very versatile for any working height. On the handle, is a lever to control the speed, there are four settings, so you can work at a speed that suits you. The cutting height is very simply adjusted with six settings from 1.25” to 3.75”. For a tough machine with plenty of high-grade steel, the Troy-Bilt TB270ES isn’t too heavy at 90LBs. Large 8” wheels at the front and rear and self-propulsion make this a very nimble and easy lawnmower to operate, even on a gradient. From the great build quality to the innovative features, the Troy-Bilt TB270ES offers a lot of lawnmower for its price. It can easily be seen as the bargain of the year and anyone looking for a really great lawnmower for hills at an affordable price won’t be disappointed by this model. Along with a good support network, Troy-Bilt offer a 2-year warranty on this mower. It really is a great deal. Complete Buyers Guide to choosing the best self-propelled lawn mower for hills. Having taken a look at what your options are when looking for the best lawnmower for hills, it’s time to take a more detailed technical view of these machines. In providing this buyers guide, my hope is that you’ll be equipped with all the information you need to make an informed decision. If you’re not entirely certain what to look for, this section of the article is definitely going to help you. How does a self-propelled mower work? As all the lawnmowers that we’ve reviewed are self-propelled, let’s start by looking at how they work. Like a regular push lawnmower, you walk behind these machines as they cut the grass. The big exception here is that the lawnmower is self-propelled. This means that the power of the lawnmower’s engine or electric motor is used to spin the blade and drive one or more wheels. The mower can be front, rear or all-wheel drive. This self-propulsion feature makes them the best lawnmowers for hills as you don’t need any effort to move them up an incline. A self-propelled lawnmower works by means of a lever, trigger, or bar that you squeeze to engage the driving wheels. This will start the blades rotating and propel the mower forward. You’re usually able to control the speed of the mower by how much you squeeze the control. This makes it possible to adjust the propulsion of the mower wheels to match your working speed. As a safety feature, the mower will come to a complete standstill and the blades will stop rotating when you release the control trigger or bar. This prevents the risk of injury if you slip or the mower moves out of your control. If you’re wondering which is better: Front wheel drive or rear wheel drive lawnmowers? You need to look at your yard and how you’ll be using the mower. Front wheel drive lawnmowers offer the best maneuverability. They’re able to make sharp turns and are the best lawnmowers for gardens with a lot of flowerbeds. Basically, for any yard that requires the operator to make a lot of sharp turns, a front wheel drive lawnmower is usually going to be the best. Rear wheel drive lawnmowers are better equipped at climbing steeper hills and steer well when traction isn’t too good. While they won’t make turns as sharp as you can with a front wheel drive mower, they are actually easier to turn with greater control. So what if you have steep hills and a lot of flower beds? The ultimate self-propelled lawnmower is the four-wheel drive or all-wheel drive mower. Like a car or SUV, a mower that is propelled by all four wheels is going to give the best traction and control. This makes that all-wheel drive propulsion is the best lawnmower for hills and intricate turns. You’ll have the best control over these mowers and they seldom lose traction, even on steep slopes. Now that lithium-ion batteries have become the norm, electric lawnmowers have become more practical. Let’s face it, trailing an electric cord behind you as you mow your lawn is troublesome and can be dangerous. For a larger yard, electric cords are just not a practical solution. By using a lithium-ion battery (or several batteries), you’re able to have all the practicalities of using a gas mower without the hassle of a gas engine. They’re also much quieter and are emission-free. So you don’t have the smell of a gas-burning engine in your yard. Most people enjoy the convenience of the single touch and effortless starting of an electric mower. Electric mowers require just about no maintenance. Apart from cleaning your lawnmower, there’s basically nothing more you need to do in order to keep it reliable. Though it’s not all sunshine and roses, battery-powered lawnmowers cost more than any other type that provide the same capabilities. You’re also limited to the working time of the battery. Buying extra batteries is the obvious way to overcome this dilemma. Though this adds to the cost of an already expensive machine. If you really want to take full advantage of your extra batteries, you’ll need additional chargers. There’s no point in having a bunch of batteries if you can’t recharge them whilst working. There are many people who have switched to battery-powered garden tools and there is one important thing to remember if this is the route you want to follow. Choose a brand and stick to it. If you’re starting out with your first battery-powered lawnmower, look at what other tools you get that use the same battery. Some batteries are used by several brands and this offers even more versatility. By using the same the battery in your garden tools, you’ll save money on batteries and eliminate the need for an endless array of different chargers for each type of battery. Traditionally, gas-powered lawnmowers have been the number one choice, especially for bigger gardens. They’re noisy, spew fumes, and need more maintenance, but there are a number of reasons why many people still prefer gas-powered mowers. Firstly, they cost less to buy. 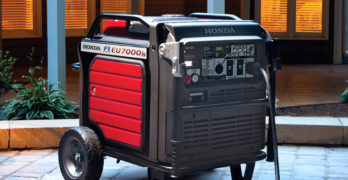 Many may feel that the running costs of a battery-powered machine are lower – there’s no gas and oil needed and they don’t require service parts like filters and spark plugs. But one needs to remember that the batteries need to be replaced. The lifespan of a lithium-ion battery cannot be determined with any accuracy, it depends on how much you use the battery and how you treat it. Generally, one can expect to replace these batteries every 2-3 years. In the end, the cost of replacing batteries vs the cost of running and maintaining a gas mower isn’t really a factor – it’s going to work out pretty much the same in the long run. These days, people have become quite used to replacing instead of repairing – this seems to be the way of the world we live in. For those of us old-school dinosaurs who still believe in machines that are meant to last, gas engines have the advantage. Unlike electric motors, gas engines are designed to be repaired. With the correct maintenance and occasional repairs, it’s possible to keep a gas engine running for decades, possibly a lifetime – if the spare parts are still available. We’re all used to having a bag or bin attached to the lawnmower which allows us to collect the lawn clippings and dispose of them neatly. There is, however, more to consider than this obvious advantage. The position of the lawnmower bag is a factor. Having a bag at the side of the mower is a simpler setup but this can get in the way when working close to trees. A bag at the at the back of the lawnmower is more practical and works the best. For larger lawns, it’s beneficial to have a bag that holds more clippings – you won’t have to empty it as often. This does add more bulk to the machine and the bigger bag will be heavier as it fills up. So for some, a large bag is better and for others, a smaller bag would be best. Most of the high-end lawnmowers have mulching blades. This is a great feature to have. These blades shred the lawn clippings and often leaves too. This can be discharged directly onto your lawn via a side chute. The benefit of mulching your lawn is that it fertilizes the lawn and retains moisture, making for a healthier lawn without any effort – it happens as you mow the grass. Because these cuttings are shredded so fine, they are absorbed into the lawn and don’t leave brown debris on the surface. Some mulching mowers also allow you to collect the mulched material in the debris bag and you can dump it onto your composter to use elsewhere in the garden. Apart from the mechanical details, there are other aspects of the lawnmower’s design that affect how we use it. The handle is going to be what you use to control the mower and its design will affect how easily you work. Padding on the handle is always beneficial, as is the height adjustment. Working comfortably is going to make you more efficient and accomplish more without fatigue setting in. The position of the trigger can also be a factor. Most triggers are positioned for right-handed operation and may not be the best for everyone. Dual triggers or a bar that can be gripped anywhere will be the most versatile. Storing your lawnmower is also something to look at. If you have limited space, a lawnmower that folds down into a compact size is going to be your best choice. You’ll need to maintain your mower and some are easier than others in terms of accessibility and aids that making your maintenance tasks all the more easy. You should clean your deck after each use, and a hose attachment for this purpose is a big plus. Gas engines need regular service. There’s the periodic oil changes and plug changes, but cleaning your air filter is something you’ll need to do regularly – preferably every time you use the machine. Being able to unclip and clean your air filter quickly and conveniently is going to make your life much easier.